Yesterday was a funny old day. In line with every biking Dad I've been keen to get Immy on two wheels. 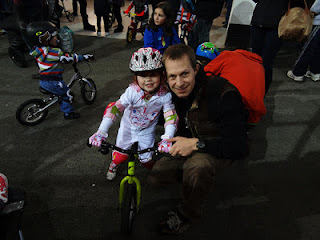 She has shown some good skills on her balance bike and as she is now four ( eeek! ) that means she will soon be moving up to the world of pedaling action. Now I am not about to sell the full susser to get a 'Dad bike',so that means a Fleabay hardtail build...woohoo. Now as some of you know I am a big Orange supporter, so I did have my eye on a P7 or re-issue Clockwork, but it would seem there are a lot of fellow fans out there so everything I was watching slipped away from the PayPal pennies. 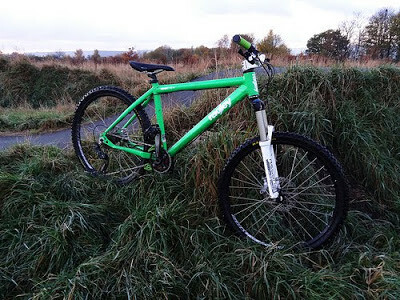 Couldn't step too far away from a bike designed in the North, so ended up getting a silly price on a Ragley MmmBop. It's an older burly design, but should do me proud for Dad duties...i.e. towing and teaching. Back to the tracks... I'll be the first to admit I am pretty useless when it comes to bike maintenance. I can bolt things together, but when it comes to tweaking I am better off leaving it to a shop. So after putting together the bike I needed a place to try to find out what things I need to fix and what things I need someone with more skill to fix. Roll on the delights of an old Google Earth search and a few random musings on Twitter. It would seem that in 2011 someone built a BMX track 5 minutes from my house...and then they left it? So the first track of yesterday was a cheeky hidden pump track called 'Bridgehall BMX Track'. Given that it is in wasteground I'm not likely to be riding there late at night, but early morning is a good option for me! Oh and the bike didn't fall apart( but needs some new pads, bottom bracket and some other tweakage ). The second track you can thank BBC news for.. Basically those lovely chaps at Strider and the National Cycling Centre are now running sessions on the mighty BMX track ( yes the Olympic standard one ) for sprogs. Oh and they also stepped up their marketing, hence why Vicky saw it on BBC news. So yesterday afternoon I found myself as uber proud dad running around after Immy as she hit the whoops on the track. She is 4...and she rocks it on two wheels ( and was overtaking those smelly boys ). So two tracks...and two times awesomeness. 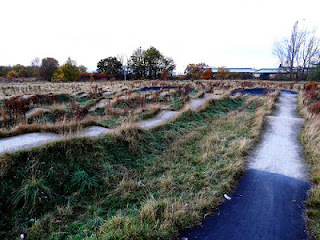 To see more pics of Bridgehall BMX track click here. 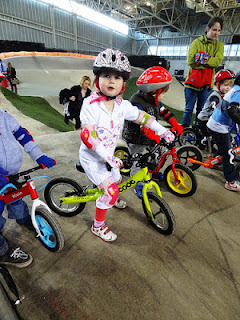 To see more pics of Immy owning the National Cycling Centre's BMX Track click here.